Torontoist Environment Editor Chris Tindal is currently engaged in a federal by-election campaign. This weekly column is an attempt to offer a behind the scenes glimpse into what it’s like to be that mysterious Other: a politician. 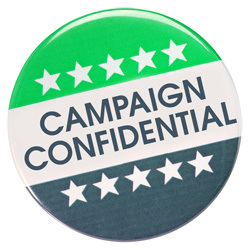 This is my last Campaign Confidential before E-day, yet I’m hesitant to pen any “final thoughts” knowing how much can happen in the final week of a campaign. It’s been a bit of a strange campaign. On the one hand, we feel really great about how things have been going from our perspective. On the other hand, the campaign has received almost no attention from the media, who have preferred to file stories about the fact that no one’s covering the election instead of, well, actually covering the election. Bob Rae’s presence, which we initially thought would be a media draw, has turned into the opposite. Most journalists seem to be so convinced that he’ll win easily (a prediction Bob has been wise not to take for granted) that they don’t think there’s anything interesting worth covering. I’ll be back once again on March 18th for an ill-considered and hasty debrief. Until then, I leave you with some final thoughts, with apologies to Harper’s Magazine.